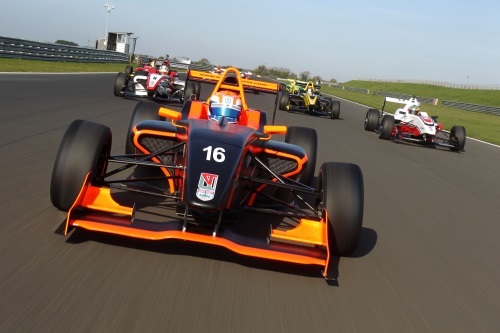 The second season of the BRDC F4 Championship blasts into life on the Silverstone Grand Prix circuit this weekend (26-27 April) with a grid of more than 20 talented young hopefuls aiming to emulate inaugural champion Jake Hughes. British newcomers include the highly-rated George Russell, who after claiming 13 karting titles in five years, including a double CIK-FIA European crown, makes the step up to cars this year partnering Moore at Lanan. 2013 McLaren Autosport BRDC Award finalist and Formula Renault BARC champion Chris Middlehurst has made the switch to F4 with Mark Godwin Racing and will partner Scottish driver David Wagner, who returns to racing after a year out in 2013. Ginetta Junior graduate Tom Jackson will race with Chris Dittmann Racing, while Jordan Albert, who lives a stone’s throw away in Silverstone Village, makes his F4 debut with Sean Walkinshaw Racing having competed in Formula Ford 1600, Mazdas and Fun Cup last year. After picking up maiden podiums in 2013, Diego Menchaca (Douglas Motorsport), Falco Wauer (Enigma Motorsport) and Gustavo Lima (Hillspeed) have set their sights on victories for their new teams, while Malaysia’s Rahul Mayer is optimistic of challenging for regular podium honours after a promising first season in 2013. Newcomers to the series include 2012 Rotax Max World Karting Champion Charlie Eastwood who races with Douglas Motorsport, partnering fellow newcomer, Mexican Rodrigo Fonseca. Another Mexican, Alfredo Zabalza, joins the international Hillspeed line-up while F4’s first Indian racer, Arjun Maini, joins champions Lanan and has proved rapid so far in testing, setting the fourth quickest time overall at the Snetterton test. Sean Walkinshaw Racing are another team with a strong international focus, having recruited Venezuelan karting ace Diego Borrelli and Formel ADAC Masters race-winner Nicolas Beer from Denmark. The new for 2014 Brazilian Petroball Racing team have signed up Rubens Barrichello protégé Gaetano di Mauro and American Dan Roeper, with Dutchman Michael Claessens completing the line-up at Mark Godwin Racing. F4 will again feature 24 races throughout the season with prestigious support slots at the Blancpain GT Sprint Series at Brands Hatch in May, as well as on the British F3 and GT bill at Snetterton in June and Brands Hatch in August. Highlights from all the rounds will again be broadcast on ITV4 and ITV4 HD the weekend after each round, as well as an additional midweek repeat. All the action from this weekend’s season opener, including live timing and text updates will be available on the official championship website www.formula4.com.